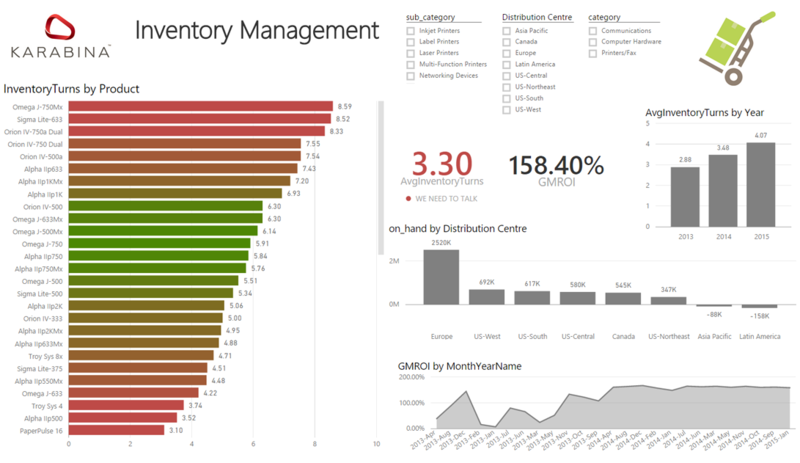 Retail dashboard with data from a standardised data warehouse solution, focusing specifically on category management, order management, inventory management and regional analysis. Karabina has established a solid track record for the delivery of quality Business Intelligence initiatives. With case studies and a large number of clients benefiting from our experience, Karabina is recognised as one of the industry leaders in this space. 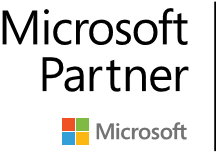 We provide the full spectrum of core foundational services from Rapid Engagements, Data Warehouse, Master Data Management and Data Quality Audits to the Analytical capabilities such as Report Platforms and Analytical Dashboards required to interpret data, focusing on the Microsoft platform exclusively. Through working with varied companies for over a decade, Karabina has also developed a number of solutions around specific industries where the collective knowledge and wisdom have been applied to technology solutions. The Industry Solutions are pre-packaged to facilitate rapid, agile implementations encapsulating IP to the benefit of our customers. 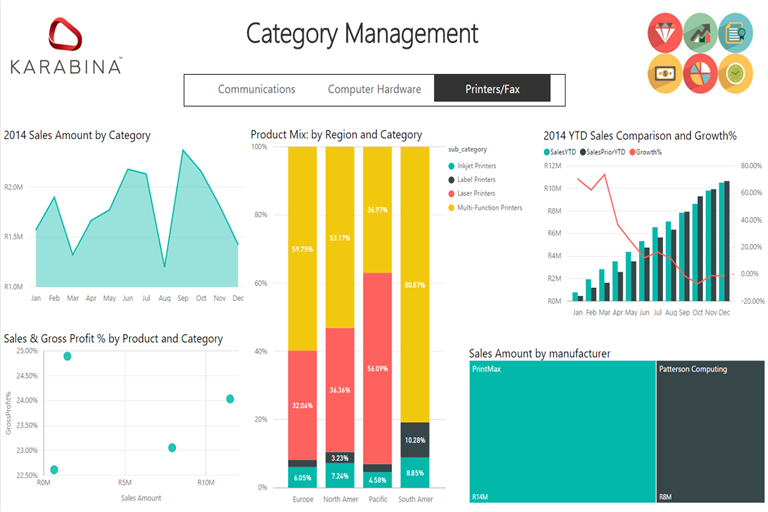 The Power BI solution showcased here is an example of one of our Retail dashboards which holds data from a standardised data warehouse, focusing specifically on Category Management, Order Management, Inventory Management and Regional Analysis. Showcasing data from a standardised data warehouse using Karabina's Business Analytics offering, the Category Management page provides information like the product mix per region as well as gross profit analysis by product and category. Drill down is enable in the scatter diagram, allowing the user to analyse either by category or individual products. 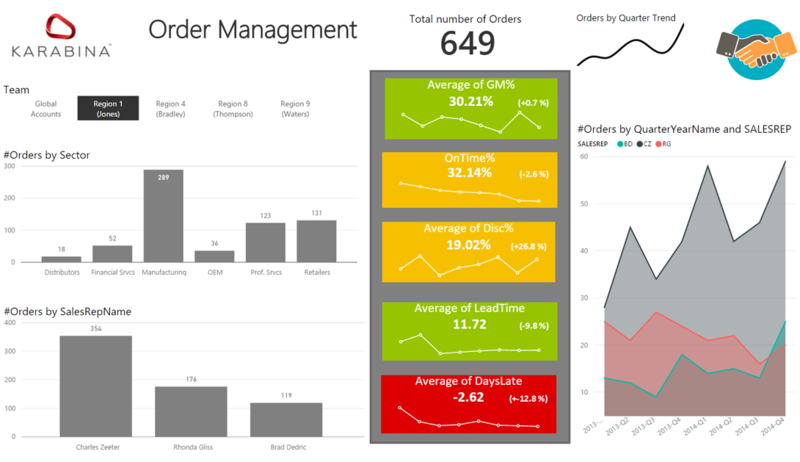 Order Management highlights the various KPIs using highly appealing custom Power BI visualisations, like gross margin %, on time %, discount %, lead time and days late. These KPIs can be analysed by Team, Sector and Sales Rep. The Inventory Management dashboard provides insights into the inventory centric KPIs Inventory Turns and GMROI. Inventory Turns measures the number of times an organisation turns over its inventory in a 12-month period. GMROI stands for Gross Margin Return on Inventory and is calculated by multiplying the annualised gross margin % by the annualised ratio of sales to cost of inventory. A value of 300% indicates that for every dollar of inventory in stock, the company made 3 dollars. The Regional Analysis dashboard delivers geographical context to the numbers, displaying Sales Amount by Category, Year and Country or City.